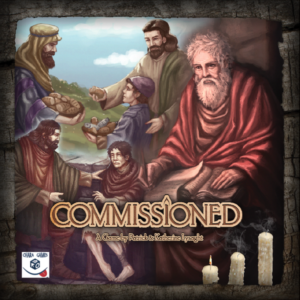 Commissioned is the first Christian-themed board game that we ever played. Is it the best co-op board game with a religious theme? Read on to find out! Commissioned is a cooperative deck building game designed by Patrick Lysaght and published by Chara Games. Players take on the roles of early apostles, spreading Christianity while trying to overcome a whole host of trials. The game has multiple scenarios to choose from and two difficulty levels. In the beginning of each game of Commissioned, players will receive an Apostle player board and a set of Faith cards that will give you special abilities throughout the game. You will also choose one of the five scenarios, which will tell you how to set up the board and what your win conditions are. There are three phases in each round of Commissioned: Arm, Live, and Mature. During the Arm phase, you are simply drawing new cards into your hand. During the Live phase, you will draw from the Trial deck, play cards to help you spread Christianity, move around the board, and grow the church. During the Mature phase, you will be able to buy new cards to add to your deck. You will go through the Live phase multiple times before you move on to the Mature phase. The Trial deck is a deck of cards that will hinder your progress throughout the game. Every round, the player with the Elder/first player token will have to draw from the Trial deck and resolve any effects on those cards. The Message Die is used after players have placed their cards face down on their player boards during the “Pray” portion of the Live phase. The player with the Elder token will roll this die to see if the group can communicate during the current turn. Each player’s unique Faith deck will help them in a number of ways throughout the game. They can use cards to get extra movement, to fulfill objectives, to spread the church, and they can even use them to buy new Faith cards. There are two types of movement in the game: Fellowship moves and Mission moves. When making a Fellowship move, you can move any of your church members to adjacent locations that already have at least one other church member in them. In a Mission move, you can move to any new location, but the current location has to have at least four church members, including at least one Missionary token or an Apostle pawn. If at any point the last church member is removed from any location, an Extinguished token is placed on one of the five candles on the board. If all five candles are ever extinguished, everyone loses. You will also lose the game if you run out of Trial cards before you have completed your objectives. That Message Die is a very cool mechanism that definitely adds to the theme. It makes sense that sometimes you won’t be able to communicate with your teammates so you will have to make the tough decisions on your own. Unlike most of the cooperative games we’ve played recently, Commissioned actually plays very well at higher player counts. Playing with six players doesn’t really slow the game down at all, actually. Turns are still quick and you always feel involved in the game. It’s also really cool that the rulebook explains the historical significance of every Trial card in the game. It’s always appreciated when designers and publishers go out of their way like that. Commissioned isn’t a very complex game, but it’s not a gateway game, either. Groups who are new to board games might have a tough time getting into this one. That’s not something we usually complain about, but since church groups will probably want to play this game, it’s a bit unfortunate that they didn’t make a slightly simpler game. Since the theme is so strong in Commissioned, it would have been great if they had invested in some better pieces for it. The Apostles are represented by pawns, the Missionaries are plain meeples, and the other church members are cubes. It would have been great if at least the Apostles were unique meeples. Small cards are sometimes okay in board games, but standard-sized cards are always going to be better in deck building games. We haven’t had any issues reading these cards, but they are tough to grip and shuffle. Commissioned isn’t necessarily going to be for everyone, but we’ve enjoyed playing it. It’s a good challenge and it’s educational without being too in your face about it. However, once we finally beat it, it’s probably not going to hit the table for us again simply because there are other co-op deck building games we’d rather be playing. That being said, if you are looking for a cooperative board game with a Christian theme, you probably won’t find a better one than Commissioned. 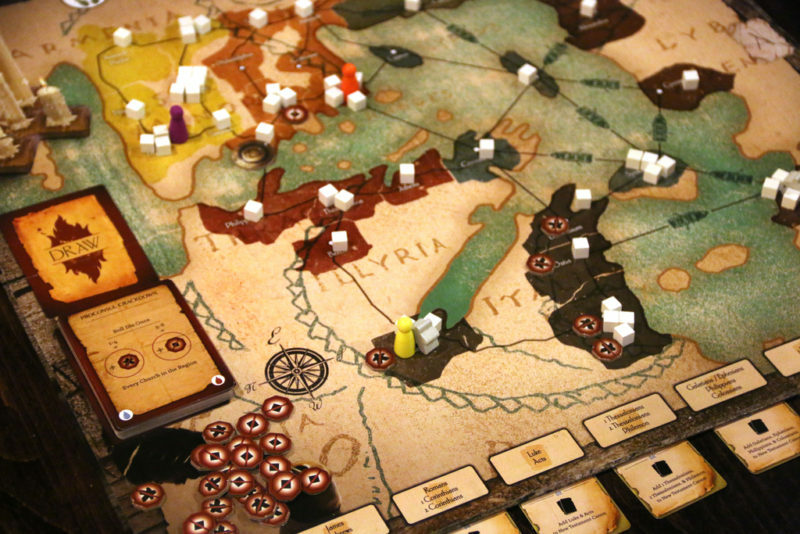 Thanks for taking the time to read our Commissioned board game review!